New Czech Glass 4mm Pearl Beads Just Added! We just added some beautiful Czech Glass 4mm Pearl Beads. 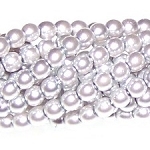 These 4mm Pearls are very nice quality beads with very rich colors. They are very uniform in size and we think you are going to really enjoy working with these pearls. Our Czech Glass 4mm Pearl Beads are imported from the Czech Republic and are sold by the strand. Each strand is approximately 18 inches long with approximately 116 pearls!